Saint John Love, Part 6. I could easily do a hundred of these and I’m positive the responses would be different (just wait until you read mine!). We’re lucky to have the selection that we do in our City for dining, entertaining, shopping… and laughing! James Mullinger is still a relatively new resident of Saint John. I’m always so pleased to see how he has seamlessly fit in to our City. James continues to be my favourite pal to meet for a coffee and catch up on the latest television crime drama. Magnolia Café. I always go in for a latte. Then once I’m in there (normally meeting you Barb!) I remember how good their breakfast wraps are and I order one of those even though I’ve already had breakfast. They are simply divine. And you can often catch world-class musicians performing there thanks to the work of music promoter and local legend Jeff Liberty. I am also in Java Moose in the Valley most days too. It’s my second office. I meet good friends like Cathy Coyle, Mark Leger, Lindsay Vautour and Alan England there at least once a week for a chat and a Speedball. The coffee Speedball, obviously. Well, compared to London – everywhere. But I am at my most happy shopping at Backstreet Records, SecondSpin or trawling for VHS tapes in Value Village or at yard sales. HMV Saint John is awesome thanks to the super cool staff in there and the fact that you can occasionally find Troma movies or Chuck Norris flicks. I also love working out with Jason Crouse at his awesome fitness studio and catching up with Keith and Nela in Nela’s Kitchen: Simply For Life in the valley. Believe it or not, I also feel very relaxed when catching up with the magnificent police offers at KV Police Station. I work with them occasionally on KV Outreach fundraisers and I always leave with a smile on my face because Steve Palmer and his team are such a lovely, hard working group of people. It is very calming to know that we have such decent and fun people looking after us. Everyone at that station does remarkable things. Amazon UK. But for my wife, always Suite Serendipity on Water Street or Judith Mackin’s Tuck Studio. Shadow Lawn Inn. Not just one of the best places to eat, drink, stay or watch live comedy but also one of my favourite hotels in the world. Utterly unique, supremely special and the owners Jamie and Mary Ann are two of the nicest people you could ever hope to meet. The Robertson at Shadow Lawn. East Coast Bistro. Port City Royal. En Sushi. World class establishments all of them. Csaba Domokos who runs Bell Aliant’s Community One channel introduced me to Splash, which is truly marvellous. As is Csaba himself. 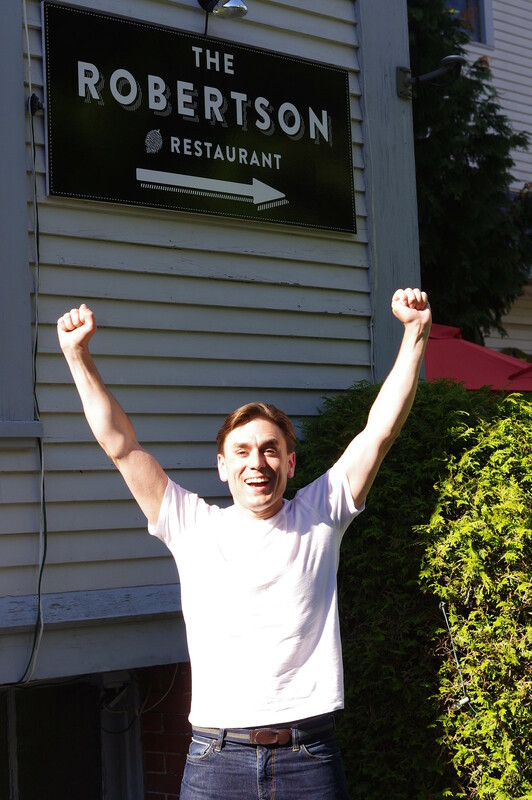 And of course at the date night shows I do at Dunham’s Run vineyard on the Kingston Peninsula are the perfect night out! You can catch awesome comedians like Geoff Hendry, Glen K Amo, Neal Mundle and Jimmy MacKinley there. I don’t really do much take out because my wife and I love cooking every night. But when we do have takeout it is always courtesy of her lovely parents who bring us House Of Chan. The restaurant looks beautiful, the food tastes beautiful and after I’ve consumed a lot of, it makes me feel beautiful! The Saint John Ale House, The Barrel’s Head and Happinez are awesome but obviously are not a secret because everyone knows how bloody brilliant they are. I love taking the Gondola Point Ferry to go for a pint at Reed’s Point Pub. And I do a lot of comedy shows for Shane Ogden at the 3 Mile, which is highly underrated. I think a lot of people haven’t been for a while so they don’t realize how nice it is in there. I love sitting on their porch sipping a pint with my director John Borbely before a show. My father in law Barry and I have a great friendship and we love going to Pete’s Pub in Brunswick Square. Pete has been there 35 years, the sign of a true local legend. When I used to visit here from England, Barry and I would always go to Pete’s for a pint and it’s a tradition we have kept up since moving here. Pete always has a story for you, a clientele of raconteurs, delicious Moosehead on tap and jumbo hot dogs. Like I say, legend. In England there are very few local independent businesses like this left. And I doubt there is a single pub left in the whole of the UK that has been run by the same person who pulls the pints themselves for that length of time. They have all been bought up by big breweries. Same goes for record shops yet Gordy has been running Backstreet Records like a master for three decades. This to me is a sign of a thriving community. People like to complain in Saint John and I do understand that there are problems here but the fact is this: England seems to have a good economy on paper because of the 1% at the top having so much wealth and squeezing normal people like us out. The wealth poverty divide is far greater in London than it is here and there is a far higher proportion of people living in abject poverty in London than there are in Saint John. Nothing is perfect anywhere but things are a damn sight better in Saint John than they are in London. So many places. Sarah Jones’ stunning art gallery. Peter Buckland’s Gallery. Obviously we are incredibly blessed to have a world-class theatre like the Imperial in our city bringing us the best in international culture. The fact that I can go see both Jim Jefferies and the Bubble Guppies there is proof alone that it is one of the best theatres in the world. It is also the most beautiful theatre I have ever played in. It is traditional and historical but unlike the crumbling London West End theatres, it is extremely well maintained. Impeccable, even. My show there last year was one of the most enjoyable gigs of my life and I can’t wait to return in October. The great thing about the Imperial is that you can trust their booking policy. You might not think that you are in to ballet or opera but go book tickets for a ballet or opera show at the Imperial and you will be seeing the very best there is of that particular art form. You can trust their decision making implicitly. I cannot think of many venues you can say that about. Obviously Saint John Theatre Company bring us incredible productions all the time and really I think the fact that we have such a thriving arts scene here is down to their hard work. I don’t think I would be able to do what I do here if they – along with people like Scott Thomas – hadn’t created this huge interest in performing arts over the past two decades. I salute Stephen Tobias and his awesome team. Always the Alehouse first. Then Happinez, Thandi’s, East Coast Bistro, Port City Royal. I could go on. The list is endless in a great city like this. There are so many beauty spots that impress my guests because this is the most beautiful place in the world. Reed’s Point Pub is a gorgeous spot for a pint and there is nowhere like it in England so that always wows. I took an award-winning British film director named Mark Murphy there a few weeks ago and he was amazed by the view. Take anyone to Tuck Studio and they will be blown away that we have one of the best interior design stores in the world in our city. Well, the liquor store obviously for Moose Light. Best beer in the world bar none. For chicken and banana bread – Cochran’s. The Irving gas station near my house where the staff are lovely and I consider them all good friends. Mostly though: probably Sobey’s. Dunham’s Run on the Kingston Peninsula where I am doing a series of shows over the summer. They are just the most perfect shows – outdoors in the most beautiful part of Canada, in a gorgeous vineyard with sun, laughter and fine wine. We shot the very first episode of my TV show for Bell Aliant Blimey! An Englishman In Atlantic Canada there. Take a look then book tickets! When I moved here I didn’t think I would be able to get my favourite Hermes aftershave or Chanel face cream in Saint John but thanks to Laura in Perfumes Plus at Brunswick Square I don’t need to go back to London to get them. And Chris at Rothesay Hair Studio always makes my dreams come true! Catch James’ brand new stand up show brought to you by Lexus Of Saint John being filmed for TV and recorded for a live concert album at the Imperial Theatre on October 8th!